June 9,2016 (San Diego) --San Diego Mayor Kevin Falconer, a Republican, won re-election handily Tuesday with 58% of the vote, avoiding a run-off with independent Lori Saldana, a former Assembly member who received 22%, and Democrat Ed Harris with 19%. Republican Council members Mark Kersey and Scott Sherman also secured their seats with over 50% of the vote, as did Senate Chief of Staff Chris Ward in the race to succeed fellow Democrat Todd Gloria in District 3.The San Diego City Council Seats that continue into a November run-off are Districts 1 and 9. San Diego may also break one more glass ceiling in November, if Mara Elliott is elected as the first woman City Attorney. February 12, 2014 (San Diego) Republican Councilmember Kevin Faulconer was elected as the next San Diego City Mayor in the special election by a substantial margin. The Registrar of Voters final tally has Kevin Faulconer with 12,7296 votes, translating to 54.53% of the vote, and David Alvarez with 11,4478 votes, translating to 45.47%. Faulconer’s election opens a vacancy on the Council—and an opportunity for Democrats to pick up a consolation prize. The Democratic-controlled Council will name Faulconer’s replacement, which is expected to give Democrats enough votes to override a mayoral veto. Still with San Diego’s strong mayor form of government, Faulconer will have many options for implementing his policies without Council approval. San Diegans head to the polls on Tuesday to elect the city’s next mayor. Councilmembers David Alvarez and Kevin Faulconer are vying for the spot. The race is a classic matchup pitting interests of working people vs. big business. Urban poor and minorities vs. wealthy powerbrokers Boosting budgets to help those in need vs. belt tightening and fiscal restraint. As the election draws near, some high-profile endorsements have been announced. Today, President Barack Obama weighed in on San Diego’s mayoral race, throwing his support behind Alvarez. Update November 20, 2013: With 100% of precincts counted but over 34,000 mail-in ballots remaining to be counted, the tally stands at Faulconer 43.58%, Alvarez 25.59%, Fletcher 24.3%, Aguirre 4.44%. Of seven lesser known candidates in the race, none attained more than a half percent. A run-off election will be held early next year between the top two. 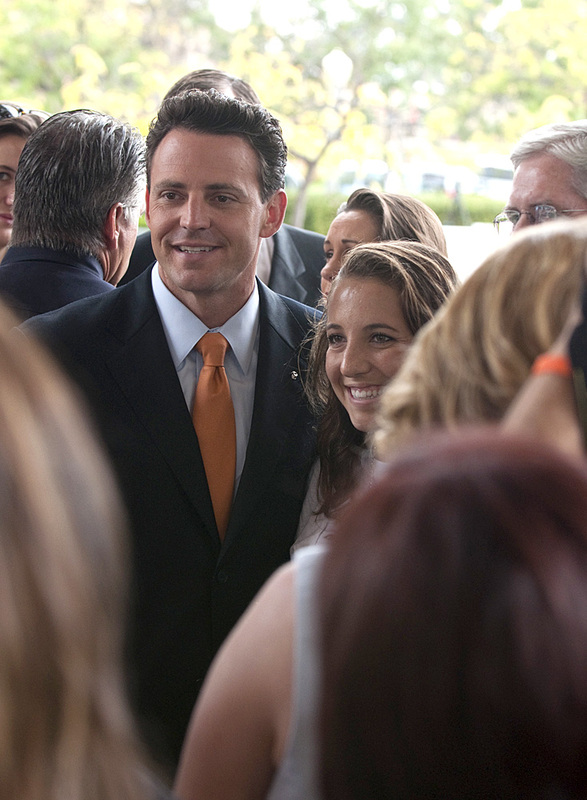 November 19, 2013 (San Diego) – The San Diego Mayoral race appears destined for a run-off election, since no candidate has captured more than 50% of the votes needed to win outright. With 86.9% of precincts counted, Kevin Faulconer, the only Republican in the race, leads with 43.84%. Of three prominent Democrats in the race, former Assemblyman Nathan Fletcher had the early lead, up by 2% for most of the evening thanks to absentee ballots. But late tonight, as working class districts polling results came in, Councilman David Alvarez, the Democratic Party's endorsed candidate, has movedahead slightly of Fletcher slightly with 25.19% of the vote to Fletcher's 24.39%. I am asking you to put human life before money. If you continue with your plans to drain Lake Morena it puts the residents of rural East County at a higher fire risk. If a fire sweeps through here and property and lives are lost because of the low water levels at Lake Morena are you prepared to live with the fact that your decision to drain the lake contributed towards the destruction? November 19, 2013 (San Diego) – As San Diegans head to the polls today to vote in a special election to fill the mayoral vacancy, Registrar of Voters Michael Vu says an expected turnout of 40 to 45 percent is anticipated, or roughly equivalent to the last citywide mayoral election in July 2005, which had a 44.33% turnout rate. If one candidate wins over 50 percent of the vote today, that candidate will be the new mayor. If no candidate achieves a majority, then there will be a run-off election among the top two vote-getters. To view our nonpartisan guide for voters in the San Diego mayoral election, click here. For more interesting facts about today's election, click "read more" and scroll down. March 17, 2013 (San Diego) – This week, Mayor Bob Filner celebrated his 100th day in office as the 35th Mayor of San Diego by releasing a list of accomplishments in his first 30 days. To the delight of some and the dismay of others, the new Mayor is shaking things up at City Hall and challenging the powers-that-be as he strives to fulfill his campaign promises for change. January 17, 2013 (San Diego)—In his State of the City address this week, newly elected Mayor Bob Filner discussed financial challenges as well as his vision for the future. He likened the city to a “patient who has overcome a serious illness,” citing a past cover-up of financial problems. “The budget surplus predicted by my predecessor last year could actually be a deficit as much as $40 million,” Filner said, noting that state funding issues and court cases remain to be resolved. “But if we learned anything from the mistakes of the past, it’s that it is better to be truthful about these problems than to cover them up,” he said. Despite challenges ahead, the Mayor laid out ambitious plans for revitalizing the region's economy, making San Diego the nation's solar capital, expanding redevelopment to neighborhoods city-wide, and improving communication systems for regional emergencies such as wildfires. November 7, 2012 (San Diego)—Today, Carl DeMaio called Congressman Bob Filner and conceded defeat, then wished the Mayor-elect good luck. With this concession, one of the most divisive races in recent San Diego memory is over. Filner will be inaugurated on December 3. With the victory of Sherri S. Leightner at 54% over her challenger Ray Ellis with 46%, the City Council will also be in Democratic hands, though FIlner has pledged to consult with people who opposed him as well as those who supported him as he sets up his administration. September 6, 2012 (San Diego)-- Mayoral candidates Carl DeMaio and Congressman Bob Filner met at the Photographic Museum in Balboa Park in a lively debate hosted by Innovation Alliance, moderated by Erik Anderson of KPBS this week. The candidates sparred over innovation, the arts and education issues, offering clear choices for voters. August 6, 2012 (San Diego)--A poll of San Diego voters shows Bob Filner with a significant 8-point lead in the race for San Diego Mayor. In a survey of 400 likely November voters in the City of San Diego, 40 percent of respondents said they support or lean toward Filner in the Mayor’s race. Thirty-two percent of respondents said they support San Diego City Councilman Carl DeMaio and 29 percent were undecided. June 1, 2012 (San Diego) –In an exclusive interview with East County Magazine, Assemblyman Nathan Fletcher laid out his vision for our region’s future. His priorities are to “make San Diego a leader in 21st century jobs” by rebuilding the economy base,” improve public education, and rebuild infrastructure to create more walkable and livable communities, Fletcher told ECM. A retired Marine and decorated Iraq war veteran who has worked in counter-intelligence, Fletcher has also laid out plans to help returning veterans on issues ranging from homelessness to jobs. “I believe it’s important to have open and transparent government,” says Fletcher, who recently made headlines by announcing that he’s left the Republican party to run as an independent, shortly after the GOP endorsed Carl DeMaio for mayor. February 16, 20 12 (San Diego) –Thousands of soldiers are returning home to San Diego County as the Iraq war ends and troop draw downs occur in Afghanistan. At the California Democratic Party’s newly formed Veterans’ Caucus, Congressman and Mayoral candidate Bob Filner, former Chairman of the Veterans Affairs Committee in the House of Representatives, laid out detailed plans to welcome home veterans with respect and hands-on help--including establishing a Veterans' Office for San Diego if he is elected Mayor. February 1, 2012 (San Diego) – A group of citizens attempted a citizens’ arrest of Mayor Jerry Sanders on Monday, alleging that his deal to temporarily change the name of Qualcomm Stadium without Council’s approval amounted to felony embezzlement. October 22, 2011 (Rancho Penasquitos) – Assemblyman and Mayoral candidate Nathan Fletcher (R-San Diego) stopped by Rancho Penasquitos as part of an “education listening tour” on Friday.